Together with six other countries, the group plans to evaluate the impact of GeneXpert Omni, in comparison with current tests. Outcomes of interest include; time to diagnosis and treatment, yield over smear microscopy, mortality, and feasibility/acceptability. Funding for the study is provided by FIND (Foundation for Innovative New Diagnostics). Rapid and accurate diagnosis of TB will be fundamental to achieving the ambitious targets set by the World Health Organization’s (WHO) new END TB strategy. In this regard, the Xpert MTB/RIF Assay (‘Xpert MTB/RIF’) on the GeneXpert platform has had a significant impact, and is now in use in over 100 countries. Additionally, the point-of-care GeneXpert Omni (‘GeneXpert Omni’) has been developed. Unlike the GeneXpert platform, the Omni is battery operated and is able to withstand significant temperature variations and environmental conditions, enabling it to be used at the point-of-care in microscopy centre level facilities. 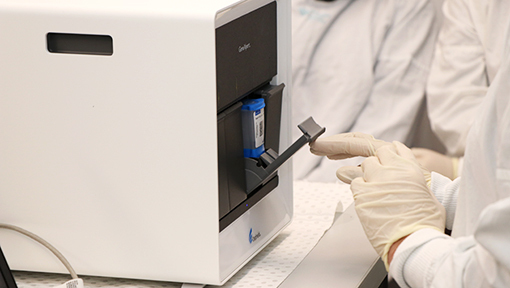 Use of Xpert Ultra on GeneXpert Omni (hereafter described as ‘Omni/Ultra’) will allow the rapid diagnosis of TB and DR-TB, allowing patients to be promptly initiated on effective treatment. The design includes an initial period in which no clusters are exposed to the intervention. Subsequently, at regular intervals (the “steps”) one cluster (in this case, equalling one facility) is randomised to cross from the control to the intervention This process continues until all clusters have crossed over to be exposed to the intervention. At the end of the study there will be a period when all clusters are exposed to the intervention. Data collection continues throughout the study, so that each cluster contributes observations under both control and intervention observation periods. Within an ethical research framework, this will enable prospective comparisons of intervention and control within (before and after the intervention introduction) and between sites (with and without intervention).